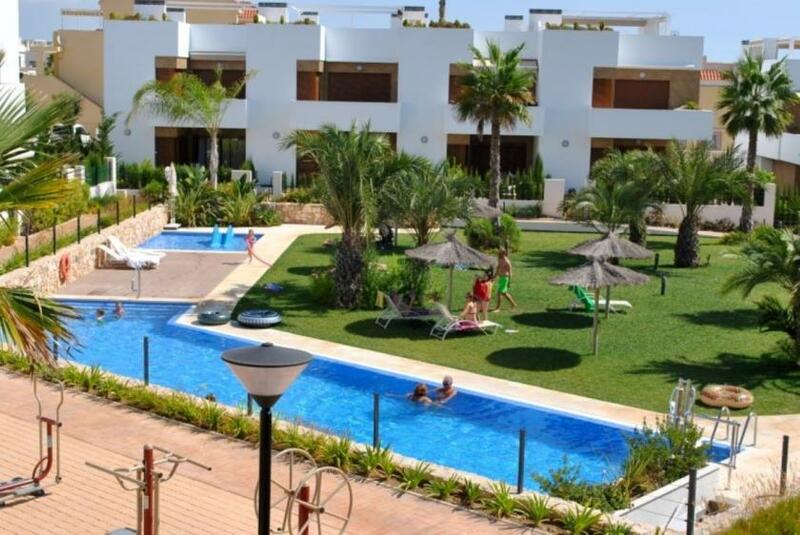 This ground floor apartment is located in the residence Secreto de la Zenia in La Zenia, Orihuela Costa. The spacious living room is nicely decorated, modern and luxury furnished, has airconditioning, SAT TV, BE, NL. DU, FR CHANNELS and a WIFI connection. There are 2 bedrooms, 1 x 2 and 2 x 1 sleeps and 2 bathrooms with shower + shower facility. The fully equipped kitchen has all the required appliances includes a dishwasher. The South-west located terrace Is fully equipped with garden furniture and sunbeds. From here you have beautiful views over the shared garden and the swimming pool. The shared garden will have a 12 x 8 mtrs long adult pool, 2 heated Jacuzzies, Sauna, Biomechanical Gym equipment, Sunbed area, Childrens pool and play area, Water tobbogan and a Bike parking area. The complex is secured and there is a comunal gated parking area. Within walking distance you will find all the facilities you can cater for your daily needs, like supermarkets, restaurants ect. Also the new shopping centre, named "La Zenia Boulevard" is located opposite the residence. This impressive and spacious centre has 150 shops with large variation in different branches. Also a lot of restaurants, bars, ect. is not missing here.